The retina is the thin layer of photoreceptor nerve cells which line the back wall of our eyes, very much like the film in a camera. Severe trauma to the retina can cause a retinal tear. However, most retinal tears are not due to trauma. They are instead caused by an interaction of vitreous and retinal factors. The vitreous body which fills the cavity of the eyeball behind the lens is strongly attached to the retina in certain parts. When the vitreous body shrinks with age, it can pull on the parts of the retina where it is attached and cause tears or holes. The retina itself may be weakened from conditions such as high myopia, previous eye injury or hereditary factors which predispose it towards tearing. The danger of a retinal tear lies in its risk of causing a retinal detachment. 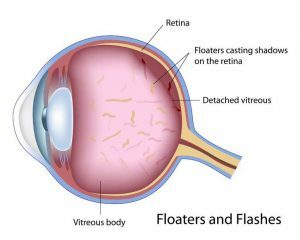 The presence of a retinal tear or hole allows fluid within the eyeball to seep beneath the retina to balloon it forward and detach it from its normal position lining the back wall of the eye. Retinal detachment will obviously cause loss of normal retina function and blindness. The location and extent of the detachment will determine the severity of vision lost. If the retinal detachment is not repaired soon, vision loss becomes permanent. It should be noted at this point that there are some types of retinal detachments that are not caused by retinal tears such s diabetic retinal detachments, central serous retinopathy, severe eye inflammations and tumours. In the early stages of retinal detachment, the retinal tear may cause bleeding into the vitreous body and give rise to the complaint of seeing a sudden shower of floaters. If the bleeding is severe, sudden total loss of vision may occur. Sometimes, the pull of the vitreous body on the retina causes the phenomenon of seeing lightening flashes. As the retinal detachment progresses, a dark shadow will block the field of vision. The location and size of the shadow will correspond to the location and size of the retinal detachment. This is the phenomenon where a patient complains of seeing lightning flashes even in a darkened room or with his eyes closed. The caused is usually due to problems within the eye. Less often it is caused by problems within the brain. Lightning flashes due to eye disorders typically come and go quickly in a matter of seconds or less. It is caused by the vitreous body pulling on the weakened parts of the retina where it is attached. This mechanically simulates the retina to produce the sensation of light. For similar reasons, the eye ’see stars’ when it suffers a heavy blow. If you experience this symptom, you should have your eyes checked by an eye doctor. It may be an early signal of a retinal tear or detachment. This is especially so if the lightning flashes are accompanied by increased floaters or a shadow blocking the field of view. Lightning flashes which last for longer than a few seconds to minutes are almost always of brain origin. The most common cause is a type of migraine called ophthalmic migraine. Here, the lightning flashes come in C shaped patterns of jagged or wavy lines. The flashes are often followed by headaches. The condition is best treated in the early stage of a retinal tear or hole before retinal detachment occurs. Retinal tears/holes are easily treated using the laser to ‘spot weld’ the retinal around the tear/hole so that fluid will not seep beneath the retina to cause a detachment. In selected cases of early retinal detachments, laser surgery may also be used to ‘spot weld’ the retina and prevent progression. Sometimes this may be supplemented by injection of a gas bubble into the vitreous cavity to help push the retina back to its normal position. In more advanced retinal detachments, surgery will be needed to re-attach the retina to its normal position. During surgery, the retinal tears are identified and sealed by application of heat, laser or freezing treatment. A silicone implant is often sutured onto the eyeball to give additional support by pressing the wall of the eye to ensure a better seal of the retinal tear. Sometimes, the fluid that has collected beneath the retina will need to be drained. This is done through a small needle puncture through the eye wall. In cases of retinal detachments complicated by scarring or in recurrent retinal detachments, a relatively new surgery called vitrectomy has been developed. Using vitrectomy, the surgeon is able to operate directly on the retina within the eyeball itself. With today’s advances in eye surgery, more than ninety per cent of retinal detachments can now be successfully reattached. However, it is sometimes necessary to have more than one surgery. Successful re-attachment of the retina does not necessarily equate total recovery of vision, although most patients will notice a marked improvement over their pre-operative vision. This is because the retina is essentially a nerve tissue and all nerve tissues regenerate themselves poorly when damaged. Book Appointment for Treatment of Retinal Tear and Retinal Detachment Today!